Google reveals the prototype of the much awaited Drone from Google. 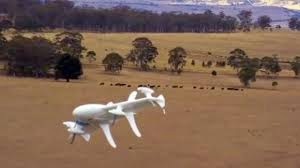 Google Company is working for past two years to build a flying robot which is capable of delivering the products across a particular city within very less time. In the initial phases of developing the project, the company comes with an unusual design called as a tail sitter, which was a combination of plane and helicopter that takes off in vertical position but flies in horizontal position after rotating. For delivering the package it floats and delivers the package down to the earth by winching. At the end of the rope, there could be a little bundle of electronics, which detects that the delivery item has hit the ground, detaches it and which can be pulled back in to the vehicle. The main motive of the programmer while designing the delivery drone is to create a self-flying vehicle or machine, to program it in such a way so that it can take off and land anywhere with a really fast speed and drops the accurate packet from the air to the desired location. Already large numbers of people are already working on this project. Google will start hiring new persons soon for this project. Most of the packages in this prototype will be dropped from the sky on a very small lifter from a robot which could be flying in the air.